Everyone knows the Disney Princesses, but few know that their image has been the result of long studies, including chromatic ones. 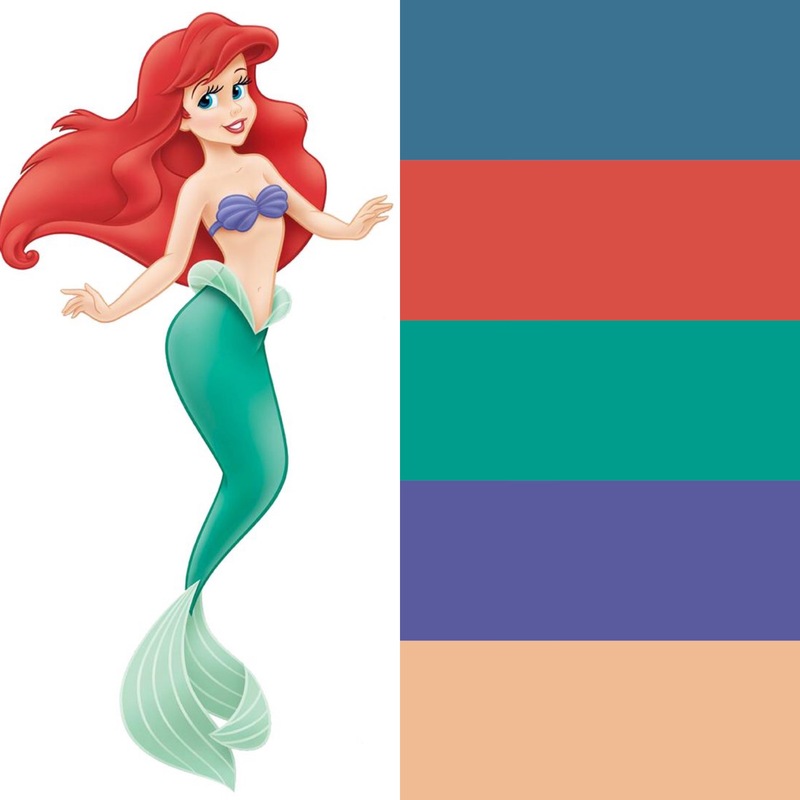 Yes, even the Disney Princesses have done color analysis! In chronological order, it is the first Disney princess: it took months of testing before realizing her final image. For the face, she is a mix of different references, including Betty Boops and Ginger Rogers. The colors of the dress are strong and contrasting, just to highlight the natural contrast of black hair on the skin. In fact, we see the three primary colors: red, yellow and blue. It is a very delicate pincess, in appearance, in character and in colors. 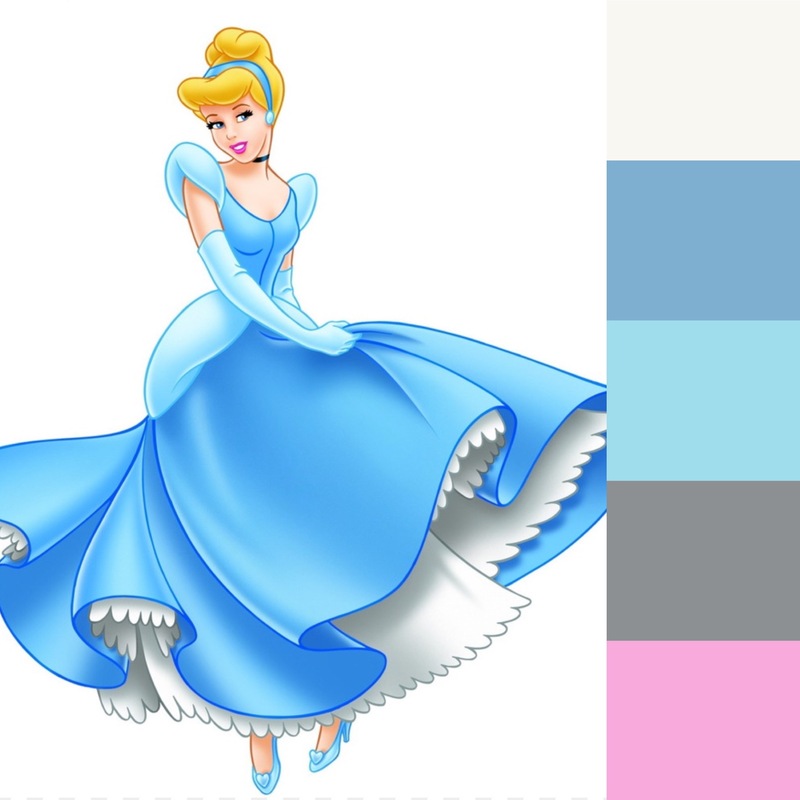 Cinderella is sweet and good-hearted, so it is represented by soft and dusty colors: her dress is declined in shades of blue, a mild color that evokes calm and tranquility. Beginning with the name, inspired by the light of dawn, this character evokes warmth and radiance. 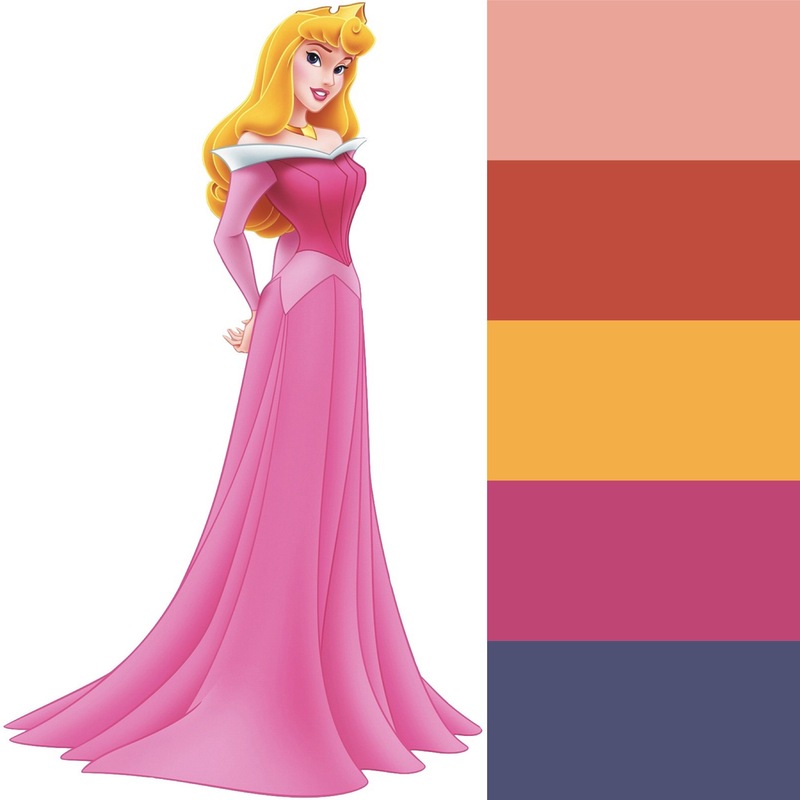 The original fairy tale describes her with long golden hair and sapphire eyes: according to the principles of color analysis, these are warm and bright colors. Less algid than Cinderella, Aurora wears necklace and tiara in yellow gold. The Little Mermaid dates back to 1989 and is the character that marks the rebirth of Disney. It is a young, independent and very curious princess; for this reason her colors are warm and vibrant: red hair, green eyes, purple bikini-shell bra. To design Belle’s face, the designers were inspired by that of Audrey Hepburn. 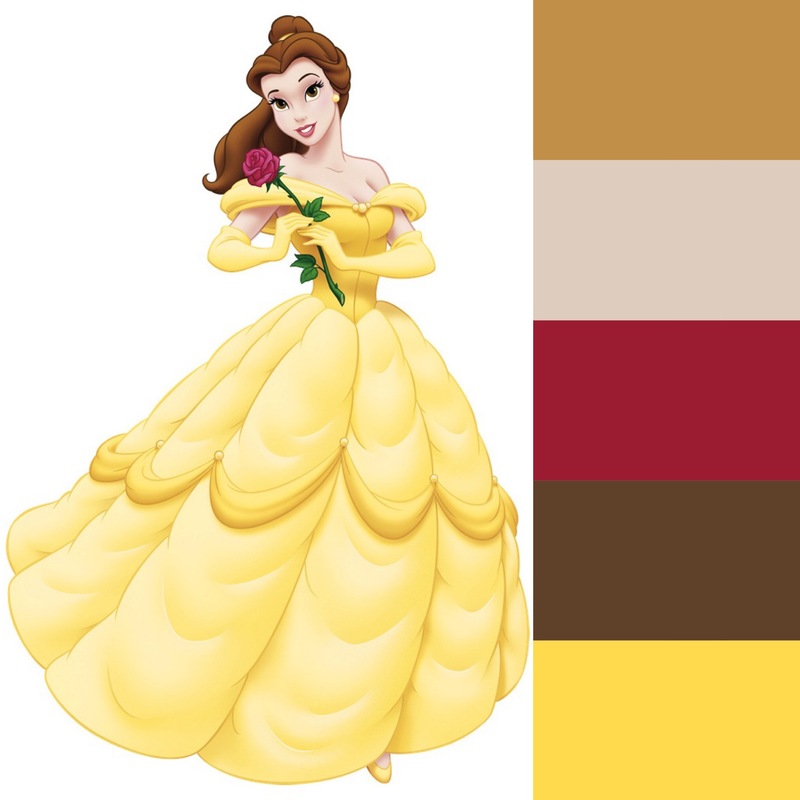 Unlike the actress, however, Belle has warm colors in her own mix of skin – eyes – hair. The chromatic choice is linked to her human personality, ingenuous and dreamer. 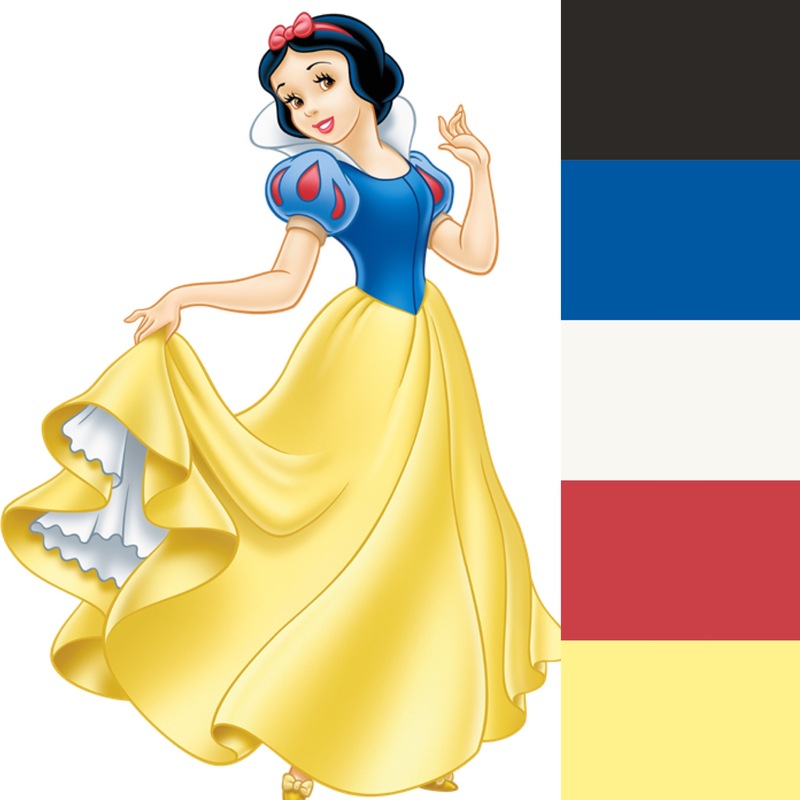 But also very eccentric, which explains the choice of the yellow dress and not a pastel color that of the other Disney Princesses. 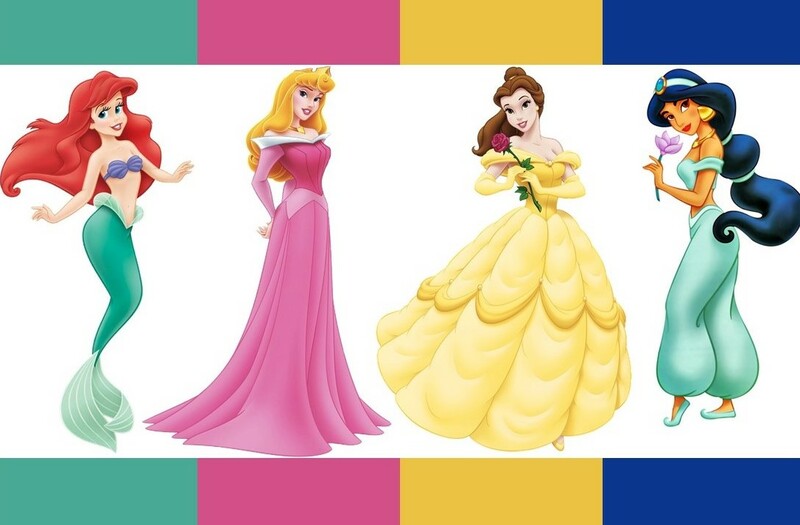 Smart, sensual and independent: among the Disney Princesses, it is surely one of the most lively! Also her colors are strong and deep: raven hair and olive skin, enhanced by clothes in shades of green and blue. Here is another free spirit, with a strong and rebellious character, also underlined by the short dress and bare feet. 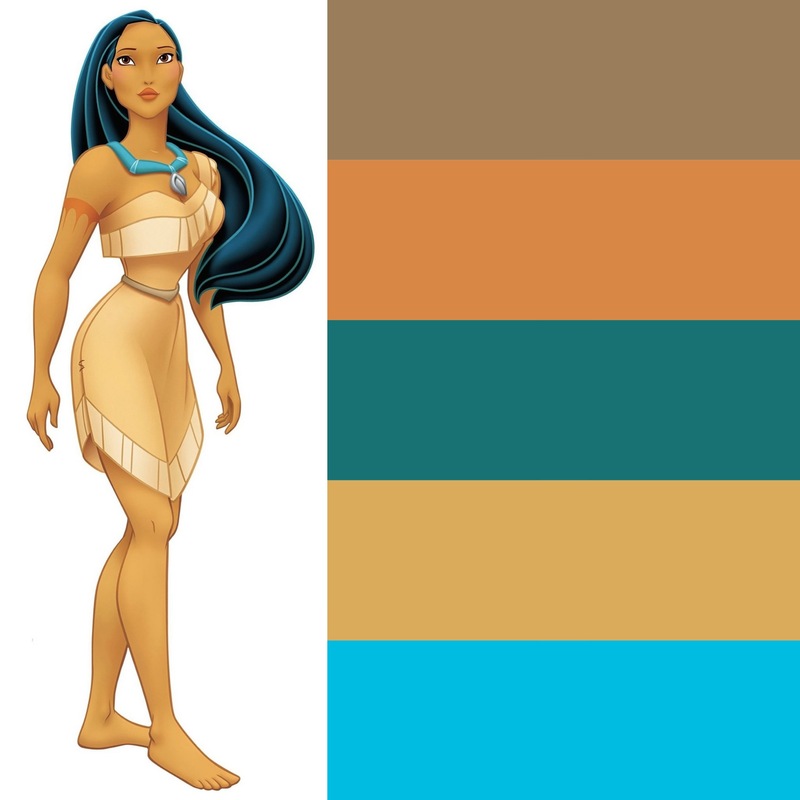 While Jasmine’s hair turns blue, those of Pocahontas seem to have shades of teal. 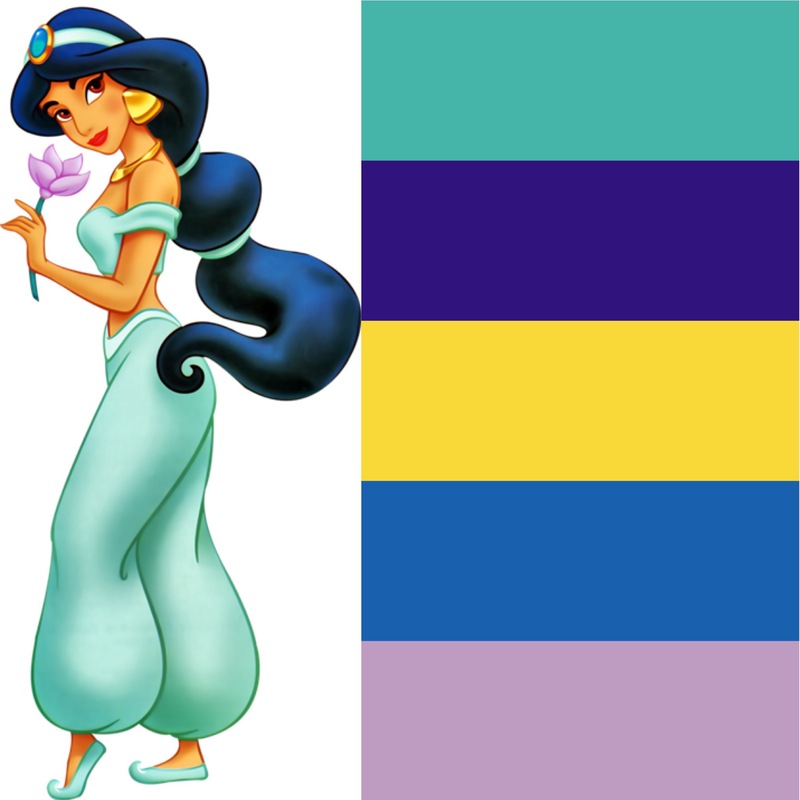 The two Disney princesses have similar colors (same subgroup), but completely different palettes. 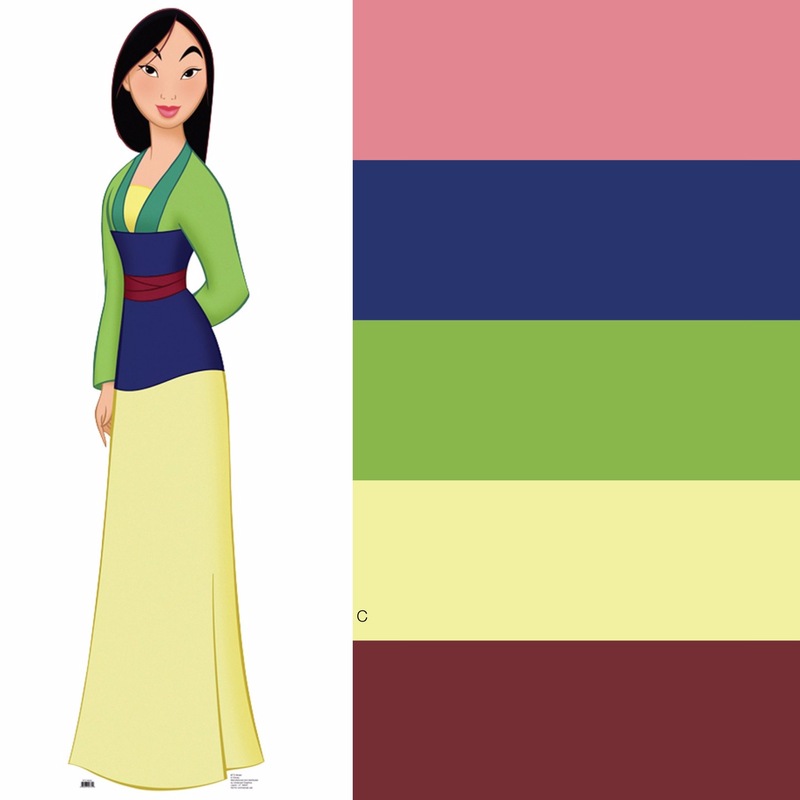 Like all the most recent Disney Princesses, Mulan is a strong and courageous character, as well as sweet and sensitive. In war she gives up her long hair to look like a boy and her kimono has both intense and soft colors. Typical of its chromatic sub-group, which enhances white skin and dark hair. Technically it is not part of the Disney Princesses, but it is certainly one of the most loved animation characters of the moment. 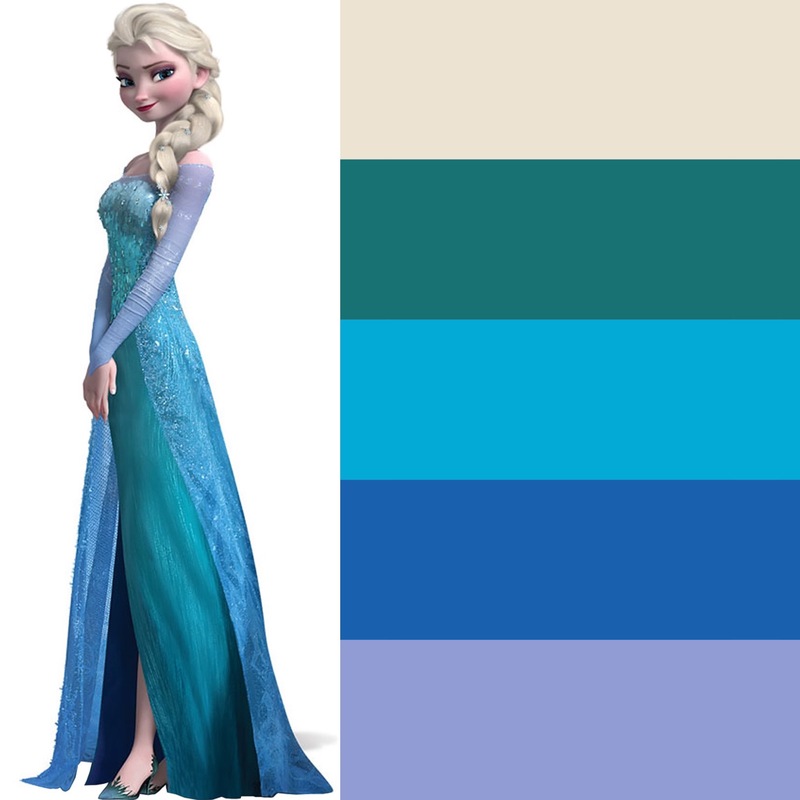 Elsa is the protagonist of Frozen: she has Scandinavian origins and the power to create and manipulate the ice. 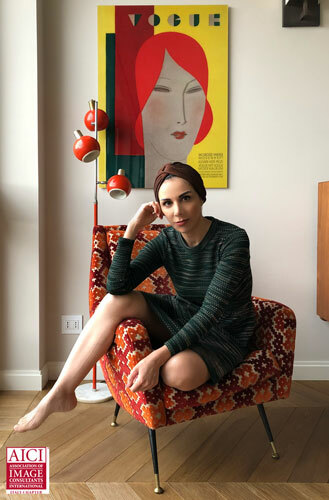 It goes without saying that the colors of her dress are cold and monochromatic in shades of blue; her hair, on the other hand, is really ice-colored. All the Disney Princesses have their own charm. What is your favorite?